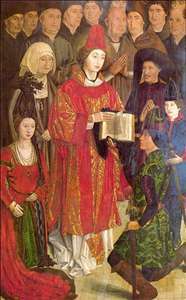 Portuguese painter, the most important Portuguese painter of the 15th century. His work may be said to have initiated the Renaissance in Portuguese painting. 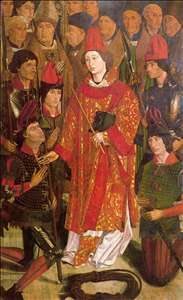 He is first named in a document of 1450, when Afonso V (reg 143881) appointed him court painter. 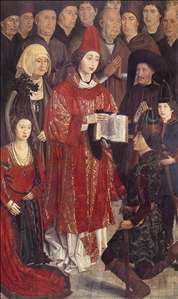 In 1470 a payment to him is recorded for an altarpiece painted for the chapel of the Palcio Real, Sintra, which, given the dedication of the chapel, probably represented the Pentecost (untraced). A document of 1471 states that Gonalves replaced the painter Joao Eanes (fl. from 1454) as Pintor das Obras da Cidade de Lisboa (Painter of works for the city of Lisbon). 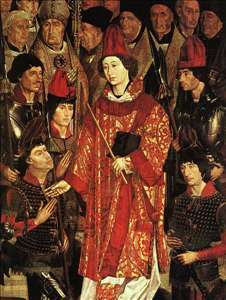 His St Vincent Altar for Lisbon Cathedral was destroyed in 1755, no works certainly by his hand survive, but there is strong circumstantial evidence that he was responsible for the St Vincent polyptych (Lisbon Museum, c.1460-70), the outstanding Portuguese painting of the 15th century. The style is rather dry, but powerfully realistic, and the polyptych contains a superb gallery of highly individualized portraits of members of the court, including a presumed self-portrait. There are affinities with contemporary Burgundian and Flemish art, especially the work of Bouts. See more details about "Altarpiece of Saint Vincent, the panel of the Knights"
See more details about "Altarpiece of Saint Vincent, the panel of the Monks"
See more details about "Altarpiece of Saint Vincent, the Archbishop panel"
See more details about "Altarpiece of Saint Vincent, the panel of the Infants"
See more details about "Altarpiece of Saint Vincent, the panel of the Fishermen"
See more details about "Altarpiece of Saint Vincent, the panel of the Relic"
See more details about "Altarpiece of Saint Vincent, detail of the "Archbishop panel""
See more details about "Altarpiece of Saint Vincent"